Entering a Week 3 slate full of marquee games that will shake up the race, Stanford's Christian McCaffrey leads SI's Heisman Watch. This is an inopportune time to begin a feature ranking candidates for the 2016 Heisman Trophy. We’re only a couple days removed from the first weekend in four years without a matchup between teams ranked in the Associated Press poll, and few of the preseason favorites for the award have delivered the sort of signature performances in high-profile settings that can create separation in the race. Week 2 was not nearly as dull as some observers anticipated—college football hardly ever fails to exceed expectations—but it still didn't impose order on the Heisman rankings. If anything, the hierarchy is less clear now than it was heading into 2016. Fortunately, Week 3 is stuffed with intriguing matchups, from Alabama’s trip to Ole Miss to Ohio State’s meeting with Oklahoma and plenty of others, that should help transform the field from an amorphous mass of qualified players to a narrow group of contenders. It’s early, but not too early to make major statements that will resonate with voters after Thanksgiving. In any case, because of the manner in which the most prestigious individual honor in college sports dominates the national conversation seemingly from the summer media days circuit to the holiday season, there’s no time to waste. I’ll be releasing a top five every week from now until the ceremony in early December. Expect a fluid list, with pre-2016 equity carrying less weight as the season progresses. One additional note, before we get to the first edition of Heisman Watch: Know that a player’s failure to appear in the “five others on the radar” category does not mean he was not considered. There is a vast pool from which to choose; whittling it down is the hard part, particularly with only two weeks in the books. That McCaffrey holds the No. 1 spot despite enjoying an early bye this weekend is a good indication of the strength of his competition—or lack thereof—to date. He’s the best player on the best team in the Pac-12, the Power 5 conference that looked least likely to earn a College Football Playoff berth as recently as a few weeks ago but whose prospects now look rosier than the Big 12’s, thanks to Oklahoma's and TCU's early losses. In his lone performance, McCaffrey seized the Friday night spotlight to slice through a game Kansas State squad for 126 rushing yards, two rushing touchdowns, 210 all-purpose yards and a later-nullified punt return that the Watch won’t soon forget. After resting this weekend, McCaffrey will need to lead the Cardinal through a brutal conference schedule, beginning Saturday against USC before games at UCLA, Washington and Oregon, plus a trip to Notre Dame. The slate provides ample opportunity for McCaffrey to burnish his Heisman résumé, but it also could work against him. With every defensive coordinator scheming against McCaffrey, the large swaths of open field he regularly burst into as a sophomore will materialize with decreasing frequency. If McCaffrey was a Silicon Valley startup on the rise last season, now he’s a corporate juggernaut with a colossal market value. Everyone’s just trying to keep up. The top spot on the first Watch belongs to a player with only one game in 2016 under his belt…and so does the second spot. Ward sat out Houston’s win over Lamar this weekend while nursing a reported minor shoulder injury. The benefit of facing an overmatched FCS opponent a week after a massive win (Oklahoma) is not lost on any fan base whose favorite program overlooked an inferior opponent after taking down a titan. But the Cardinals’ place on the Cougars’ schedule is also helpful because of what comes next. A Thursday night game at Cincinnati, now 2–0 after a win at Purdue on Saturday, is one of the stiffer tests Houston will face all season, and Tom Herman will welcome Ward back under center with open arms for a condensed week of prep. Sports Illustrated’s Pete Thamel reported Saturday that an MRI on Ward revealed no structural damage, meaning the electric, dual-threat playmaker who has chopped down two national powerhouses in his last two games (Florida State and the Sooners) will have a chance to put on a show for anyone who wasn’t paying attention on New Year’s Eve or in Week 1. Ward is a stud, and he’s already authored arguably the most significant victory of the season to date (321 passing yards, 2 touchdowns, no interceptions). For the Cougars, a win over Oklahoma was a prerequisite for a playoff run. To actually make the final four, though, Ward will need to ensure Houston avoids any slip-ups in American Athletic Conference play. Jackson took a bleh Fashion Week Friday night matchup in upstate New York between a fringe ACC contender (Louisville) and an also-ran guided by a first-year coach (Syracuse) and turned it into a breathtaking strut down a runway that left college football obsessives and casual fans alike slack-jawed. Through a mix of searing runs past defenders, shifty open-field improvisation and pin-point deep throws, he compiled 483 yards and five touchdowns by halftime, including three in the game's opening five minutes. 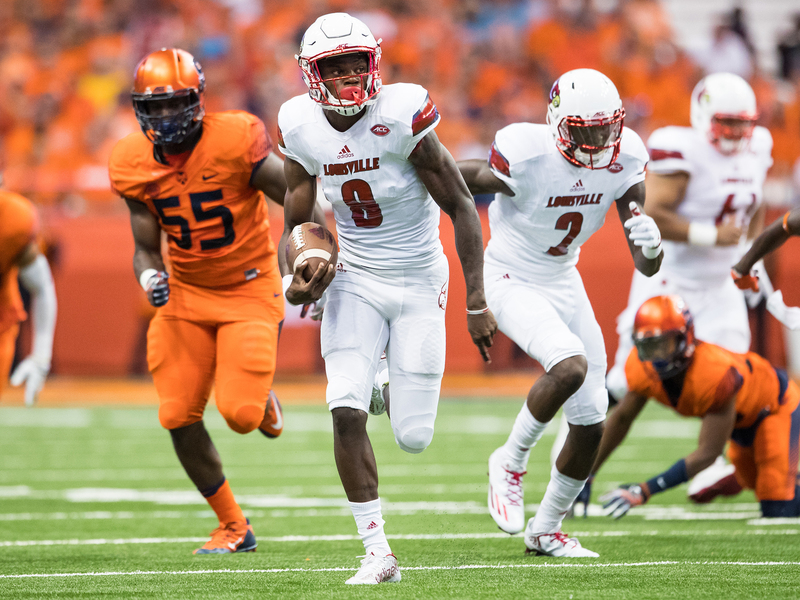 Jackson finished with an ACC-record 610 total yards in a 62–28 rout. It was the sort of performance that, for those who had better things to do on a Friday night, can be appreciated with a standard SportsCenter recap or even a glance at the box score, but its apex is worth another look. For Jackson, scoring touchdowns is as simple as training for the 110-meter hurdles. This defender might as well have been a stationary object. The master class against the Orange came a week after Jackson lit up Charlotte for eight touchdowns in one half. The main reason he’s not higher on this list right now is the level of competition, but that’ll change in short order. Louisville welcomes No. 2 Florida State to Papa John’s Stadium on Saturday. Let’s see what Jackson can do against a really good defense, albeit one missing its best piece in safety Derwin James (knee surgery). Listing Francois here is, well, sort of weird. When I chose his teammate, running back Dalvin Cook, to win the Heisman in SI's preseason Crystal Ball, I fully expected Cook to plant a flag on top of Mount Heisman by shredding Ole Miss in a primetime Labor Day matchup. Instead, the running back botched a sure second-quarter touchdown by losing the ball out of bounds near the goal line, and Florida State overcame a slow start for a 45–34 win thanks in large part to Francois. The way the redshirt freshman has played so far (69% completion percentage, five touchdowns and only one interception), Sean Maguire, who was in contention for the starting job with Francois this off-season, is probably not going to get on the field for anything other than garbage time this season. The Francois hype picked up during spring practice and grew during preseason camp, but he’s totally lived up to it—an even more difficult task given the inevitable comparisons to the most recent redshirt freshman Seminoles passer unveiled on Labor Day (Jameis Winston) and Florida State's popularity as a national title pick with few off-season question marks other than the most important position on the field. It’s not inconceivable Francois could be unseated in the Heisman race by Cook at some point, but Francois deserves this spot for now. The aforementioned game at Louisville provides another chance for him to go off with the entire nation watching while putting a dent in Jackson’s candidacy. Let’s start with the obvious: Notre Dame has already lost. This is true, but as it pertains to Kizer’s Heisman bid, it’s not disqualifying. One of the biggest points of discussion coming out of the Irish’s double overtime defeat to Texas was Kizer’s scintillating performance, a six-touchdown barrage with a bevy of clutch throws that registered a 206.5 quarterback rating. Notre Dame didn’t return to South Bend with a victory in one of its only three true road games this season, but it might have had coach Brian Kelly abandoned his strategy of rotating Kizer and Malik Zaire earlier in the game. If Texas emerges as a playoff threat—or, at the very least, turns a corner to win eight or nine games and cool the hot seat talk surrounding coach Charlie Strong—Kizer’s performance will come to be viewed as an immensely impressive data point. And he followed it up by completing 15 of his 18 pass attempts in a rout of Nevada last weekend. Kizer established himself as more-than-capable quarterback last season when he guided Notre Dame to within one field goal of a possible playoff spot, and he’ll probably need to do something similar to warrant an invitation to New York this year. The Texas defeat hurts in that regard, and Notre Dame’s depth in the secondary is troubling, but Kizer is good enough to haul the Irish into the CFP mix. It’ll be fascinating to watch him try.